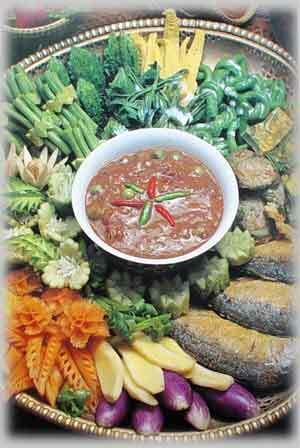 The Central region also has what is termed Royal Cuisine, a more sophisticated version of regional cuisine. Influenced by the kitchens of the Royal Court, dishes are elaborately prepared, making it as much an art form as a culinary masterpiece. As the largest agricultural area in the country, rice is an essential element of every meal. Various kinds of curries are used to bring a splash of variety to Central Thai food. Tom Kha Gai, a thick coconut milk curry made with chicken or meat with lemon grass; Kaeng Som, a spicy sour soup with fresh vegetables, shrimps or fish; Kaeng Liang, a traditional herbal, mild and spicy soup with vegetables; Phat Phak, or fried vegetables with oyster sauce, and Phat Prieo Wan, sweet and sour versions, are best known to complement rice and curry; Yum, a spicy salad dish full of torpedo-shaped chillies, which is quite popular and often ordered with a pre-dinner drink; and Nam Phrik, the most original Thai dish of all, which offers an array of different versions, all incredibly pungent to a foreign nose.